How long should I work for this company? Is it better to gain experience – and potentially promotions – working for one company, or would my resume benefit from diversifying my experience and working for a number of different organizations? Will I be considered a “job hopper”? In my experience as a recruiter and resume writer, the longer you stay at one company, the more difficulty you may have marketing yourself in your search. This is not a set rule, just an observation, and really depends upon your background and level. 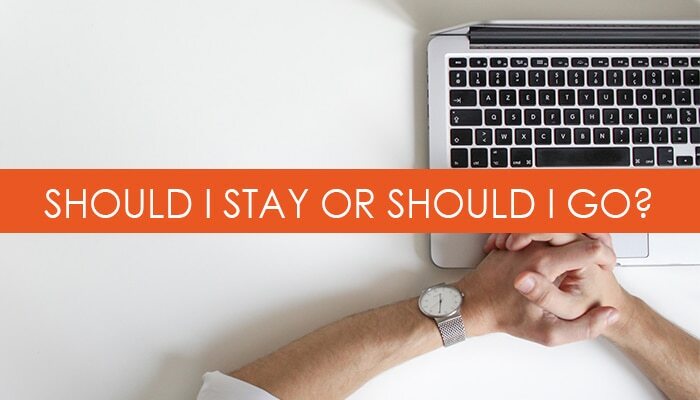 Despite opportunities for advancement, after a certain number of years, staying at the same company can make a candidate look too comfortable, and lacking in career advancement versus someone who is looking for new opportunities or challenges. On the flip side, not staying at a company long enough may give off the impression that you’re a “job hopper”, making hiring managers question whether the investment in hiring you will provide a return. That’s not to say there isn’t value in moving up through a company. Progressing through multiples roles, exploring other departments or functions, and increasing your responsibility can add value to your resume if that story is communicated effectively. At the same time, employers want to see both diversity and relevance. A well-rounded candidate has worked for different organizations, but still has experience that’s directly relevant. These days, it’s common for people to stay at a job no longer than 2 years, but less than a year can be a negative mark. Remember, hiring is an extremely costly investment, and companies are less likely to take a chance on someone who has a track record of jumping ship. Whether you spent years at one organization or moved around between companies, what matters is how you frame the experience. Did it add value in some way? What did you learn, and why is it important to the person/organization you’re trying to appeal to? If you left a position because the company reorganized, or you were presented with a more strategic opportunity to advance your career, this might be something to discuss in your cover letter. And if you built your 20-year career in the same organization? Talk about why that was a positive experience both for you and your employer. There is value in someone who shows longevity and is essentially a brand evangelist. Use this as a case study for why it’s important to align yourself with a company where you can build a future. Make your story work for you. Need help crafting a powerful narrative and positioning yourself for the next level? Contact us to learn how we’ve helped thousands of other candidate reframe their experience for better results. Tags: branding, career, career change, communication, job search, job searching, personal branding, resumes. Bookmark the permalink.